Recurrent respiratory papillomatosis (RRP) is caused by human papillomaviruses (HPVs), primarily types 6 and 11. The disease is characterized by multiple recurrences of airway papillomas, resulting in high levels of morbidity and significant mortality. The prevalence of latent HPV in the larynx of the general population is much greater than the prevalence of RRP, suggesting a host-susceptibility factor for disease. We report that the oncogene Rac1 and its downstream product cyclooxygenase-2 (COX-2) are both constitutively expressed at high levels throughout the airway of these patients, independent of active HPV infection. Use of the COX-2 inhibitor celecoxib in primary papilloma cell culture resulted in the downregulation of HPV transcription. Furthermore, a proof-of-principle study treating three patients with severe RRP with celecoxib resulted in remission of disease in all cases. Therefore, we have identified the first pharmacologically targetable host-susceptibility pathway that contributes to RRP recurrence. AVL and RW contributed equally to this work. Recurrent respiratory papillomatosis (RRP) is a rare but devastating disease in which papillomas recurrently grow in and block the airway. It poses a significant cost to society and burden on the patients because of the high frequency of surgery (on average, four times per year) (1). Respiratory papillomas also have the potential for malignant conversion, especially if they involve the lower airway. 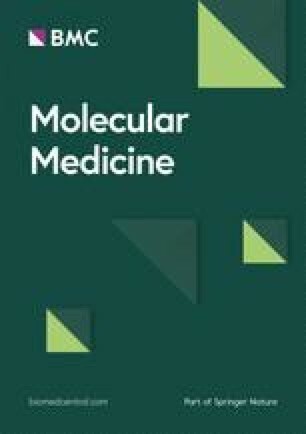 We previously reported that key signaling proteins, including the epidermal growth factor receptor (EGFR) and the small Rho-GTPase Racl and the proinflammatory molecule cyclooxygenase-2 (COX-2) and its product prostaglandin (PGE)2, are overexpressed in papillomas when compared with normal tissues from non-RRP patients (2, 3, 4). These proteins have been implicated in other neoplasms. EGFR activity increases proliferation and inhibits apoptosis, contributing to the growth of many epithelial cancers, and is a target for multiple drugs currently used to treat lung, colorectal, pancreatic and head and neck cancers (5). Racl is a key node in signal transduction networks that regulates many biological functions, including cytoskeletal structure and proliferation (6), and has been implicated in tumorigenesis (7). The role of COX-2 in carcinogenesis has been most well studied in colorectal polyps and cancers, where inhibition of COX-2 has been shown to decrease the risk of colorectal cancers by 40–50% (6,8). We found that in papilloma-derived epithelial cells that EGFR, Rac1 and COX-2 act in a linear pathway with EGFR upstream of Rac1, which in turn results in increased expression of COX-2 (4). Inhibition of this pathway with the selective COX-2 inhibitor celecoxib reduces papilloma cell proliferation and increases the rate of apoptosis (3). Presuming that HPV induces this proproliferative, antiapoptotic pathway, we began to investigate the mechanism of regulation by comparing primary biopsies from papillomas, which have active HPV infection, to clinically normal biopsies from the same patient. Surprisingly, we find that Rac1 and COX-2 are overexpressed in normal tissue from RRP patients in sites as distant from the laryngeal papillomas as the distal trachea. Moreover, we show that inhibition of the Racl/COX-2 pathway inhibits HPV transcription in vitro, providing a mechanism by which overexpression of these molecules promotes active HPV infection. Finally, a proof-of-principle initial human trial with celecoxib induced long-term complete remission in two of the patients, confirming the importance of the pathway in the pathogenesis of the disease. The airway prevalence of HPV6 and HPV11 in the population is approximately 5% (9,10), whereas only 3 in 100,000 people develop disease (1), suggesting a host-susceptibility factor. We propose that the high level of Rac1 and COX-2 in the airway confers this susceptibility to RRP and that this pathway provides an ideal target for treatment of the disease. Biopsies of laryngeal papillomas and clinically normal laryngeal and tracheal tissues were obtained from RRP patients undergoing surgery at Long Island Jewish (LIJ) Medical Center. Normal laryngeal tissues were obtained from non-RRP patients at the same hospital. Use of these tissues was approved by the Institutional Review Board of the Feinstein Institute. Biopsies used for Western blotting were snap-frozen and stored in liquid nitrogen. Biopsies used for immunohistochemistry were fixed in 10% buffered formalin, paraffin-embedded and processed by conventional methods. Biotechnology, Santa Cruz, CA, USA), anti-phospho-p38 at 1:1,000 (BD Biosciences #612280, San Jose, CA, USA), anti-p38 at 1:1,000 (Cell Signaling Technology #9212), and anti-actin at 1:5,000 (Sigma #A5441). Secondary antibodies were horseradish peroxidase-conjugated antimouse IgG and anti-rabbit IgG (GE Healthcare #NA934 and NA931, Piscataway, NJ, USA). Pierce ECL Western Blotting Substrate (ThermoScientific, Rockford, IL, USA) was used to detect the signal, which was quantified with Image J software (https://doi.org/rsbweb.nih.gov/ij). Results were normalized to actin and expressed as means ± standard deviation (SD). Paraffin-embedded tissues were sectioned and deparaffinized using standard methods. Antigens were retrieved using 10 µg/mL proteinase K at room temperature for 20 min. Sections were immunostained with the anti-Rac1 antibody (Millipore), detected with AEC Single Solution (Invitrogen) and counterstained with hematoxylin. Statistical analysis for both Western blots and quantitative polymerase chain reaction (PCR) was performed with a two-tailed Student t test. No statistical analysis was done on the pilot clinical trial since the number of patients was limited. Epithelial explant cultures of papilloma cells were established as previously described (11), and cells were subcultured in serum-free complete keratinocyte growth factor (KGM) medium as previously described (3). CaSki cells were maintained in RPMI 1640 medium plus 10% fetal bovine serum. Both cell types were grown to approximately 80% confluence, fed with KGM lacking epidermal growth factor and insulin overnight and then incubated with complete KGM containing either 500 nmol/L PGE2 or 5 µmol/L celecoxib for 48 h.
RNA for analysis of viral mRNA levels was isolated from cultured cells using the High Pure RNA Isolation kit (Roche, Indianapolis, IN, USA). Combined HPV11 E6 and E7 mRNA levels were assessed with primers at nucleotide (nt) 237–255 and 311–291, with a probe from nt 260–289. HPV16 E6/E7 primers were at nt 617–642 and 669–689, and the product was detected with the Roche Universal Library probe 63. Data were normalized to transcripts for ribosomal phosphoprotein P0 (12), as previously described (3), and expressed relative to control cells treated with dimethyl sulfoxide. Three subjects with moderate to severe RRP, defined as requiring surgery at least three times within the past year to maintain an airway or evidence of tracheal involvement, were enrolled in the pilot for a planned large double-blinded placebocontrolled clinical trial of celecoxib (Pfizer, New York, NY, USA), a selective COX-2 inhibitor, to determine whether it would have potential therapeutic efficacy as an adjunct to surgery. The study and consent form were approved by the North Shore-LIJ Institutional Review Board. All subjects signed the approved consent form. Subjects were evaluated by direct laryngoscopy/bronchoscopy for disease severity at enrollment and at 3-month (±3 wks) intervals for 30 months, with all visible papillomas removed at each endoscopy. Disease severity was determined using a previously validated scoring system that quantifies recurrent papilloma mass (13,14). Recurrent growth rate was calculated by dividing severity score by number of days since the previous surgery. Subjects were randomized to one of two treatment arms 6 months after enrollment. The subjects in the early arm began 1 year of 200 mg celecoxib twice daily, followed by 1 year of twice-daily placebo. The delayed arm received placebo for the first year, followed by 200 mg celecoxib twice daily for the second year. Subjects and physicians were blinded to group assignment. For subjects with no evidence of recurrence, some scheduled direct endoscopies were waived, and indirect laryngoscopy was conducted instead. The subjects were then followed informally for up to 5 years after completion of the pilot study. Response was defined as a ≥50% reduction in disease severity during any time on the study. The phase II extension of this study is in progress and is registered with ClinicalTrials.gov (NCT00571701). Hypothesizing that HPV infection activates the EGFR→Rac1→p38→COX-2 pathway, we compared primary biopsies from laryngeal papillomas, which have active HPV infection, to clinically normal biopsies from the same patient, which have either latent or no HPV infection (15). Western blot analysis of the EGFR confirmed increased expression is limited to papillomas of RRP patients (Figure 1A). Thus, overexpression of the EGFR depends on active viral infection. Unexpectedly, when we investigated the downstream members of this pathway, we found that all upper airway epithelium from RRP patients had elevated levels of Rac1, with no significant difference between the papillomas and the clinically normal tissues, even in sites as far away from laryngeal papillomas as the distal trachea (see Figure 1A). Because of the limiting size of normal biopsies, the normal sample in this figure has slightly less protein loaded. We corrected for this in the graph where Rac1 expression was normalized to actin before being compared with Rac1 levels is the papilloma. Rac1 expression in tissues far from active infection suggested that the increase in Rac1 is inherent to patients with this disease and is not caused by the virus. 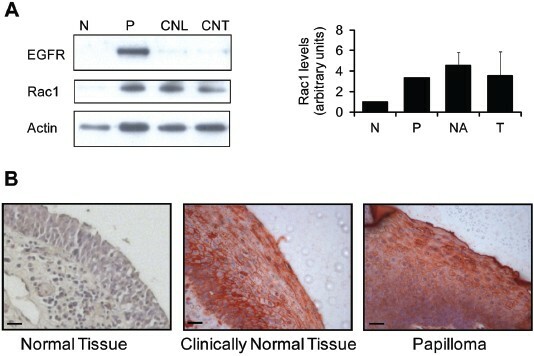 Immunohistochemical analysis of papillomas and clinically normal laryngeal biopsies showed that Rac1 is expressed throughout the epithelium in both papillomas and clinically normal tissue of RRP patients (Figure 1B). This result further supports our discovery that the increase in Rac1 expression is inherent to patients with this disease and is not caused by HPV activation, since viral expression is predominantly in the more differentiated spinous layers of active lesions. Rac1 is overexpressed in clinically normal airway tissues of RRP patients. (A) A representative Western blot, showing EGFR and Rac1 expression levels in normal laryngeal tissue from a non-RRP patient (N), compared with papilloma tissue (P) and autologous clinically normal laryngeal tissue (CNL) and clinically normal tracheal tissue (CNT) from an RRP patient. Actin is shown as a loading control. The graph shows mean ± SD of Rac1 levels of papillomas and clinically normal larynx and tracheal biopsies from six different patients compared with biopsies from a non-RRP patient. A previous publication showed the statistical difference between normal (N) and papilloma (P) tissues (4). There was no statistically significant difference in Rac1 expression between the three tissue types from RRP patients. (B) Immunohistochemical expression pattern of Rac1 in papillomas and clinically normal laryngeal and tracheal tissues of RRP patients, representative of staining patterns seen in one patient included in Figure 1A and five additional patients. Because Rac1 activity has been shown to transform cells (16), we investigated the possibility that the Rac1 found in clinically and histologically normal tissues of RRP patients was inactive. Ideally, direct measure of Rac1 activity would be assessed with a p21-activated kinase (PAK) pull-down assay; however, the limited size of the biopsy tissues does not provide enough material for this assay. As a surrogate, we analyzed the activation state of downstream signaling molecules by Western blot. We have previously shown that Rac1 activates the kinase p38, thereby inducing COX-2 expression in a papilloma-specific pathway. Analysis of this pathway in patient biopsies revealed that p38 was activated in both clinically normal laryngeal and tracheal tissues to the same levels as in papillomas (data not shown). Most significantly, we analyzed the expression of COX-2 (Figure 2). Although there was some variation in COX-2 levels, they did not significantly differ between airway sites in the RRP patients, but were greatly elevated when compared with tissue from non-RRP patients. Thus, the elevated Rac1 in the clinically normal tissue of RRP patients is active and inducing COX-2 expression throughout the airway, an intrinsic defect in signaling regulation. The Rac1 →COX-2 pathway is activated in clinically normal tissues of RRP patients. A representative Western blot of COX-2 levels in laryngeal tissue from a non-RRP patient (N) and papilloma (P) and clinically normal laryngeal (CNL) and tracheal (CNT) tissues from a RRP patient is shown. Actin is shown as a loading control. The graph shows mean ± SD of tissues from four different RRP patients compared with normal tissue from a non-RRP patient (N). Previous publication showed the statistical difference between true normal and papilloma tissues (3). There was no statistically significant difference between COX-2 expression in papillomas and clinically normal tissues of RRP patients. The constitutively high levels of Rac1 and COX-2 in the airway of RRP patients suggested that the Rac1/COX-2 pathway may provide a permissive environment for active HPV expression, thereby enhancing the patients’ susceptibility to papilloma formation. To test this hypothesis and to determine whether such enhancement would be limited to HPV6 and HPV11 or might also pertain to high-risk types such as HPV16, we treated cultured HPV11-positive papilloma cells and the HPV16-positive cervical carcinoma line CaSki with PGE2 and with celecoxib and measured steady-state levels of viral E6/E7 mRNAs. PGE2 is a downstream product of COX-2, thought to be important in the tumorpromoting functions of COX-2. It is expressed at elevated levels in many cancers, including lung and head and neck (17,18). Celecoxib is a selective COX-2 inhibitor that inhibits synthesis of PGE2 and has been used in multiple clinical chemoprevention studies (19). E6 and E7 are early genes that are not only essential to the viral lifecycle, but code for the proteins most implicated in HPV-induced carcinogenesis (20,21). Incubation of cells with additional exogenous PGE2 resulted in an increase in E6/E7 mRNA levels, whereas inhibition of COX-2 with celecoxib decreased the RNA levels (Figure 3). These changes were not general transcriptional effects, since the changes in E6/E7 mRNA levels were normalized to transcripts for a cellular gene. Notably, HPV16 was even more sensitive than HPV11 to changes in PGE2 levels. These results support our hypothesis that constitutive COX-2 expression contributes to susceptibility to HPV-induced RRP and suggest that this mechanism may be applicable to other HPV-induced diseases. COX-2 and PGE2 affect E6/E7 mRNA levels. 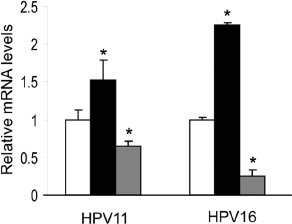 Papilloma cells, containing HPV11, and CaSki cells, containing HPV16, were incubated with 500 nmol/L exogenous PGE2 or 5 µmol/L celecoxib for 48 h. Combined HPV E6 and E7 transcripts were analyzed by quantitative PCR, normalized to ribosomal phosphoprotein P0, clone 36B4, and expressed relative to control cells treated with dimethyl sulfoxide. Results are means ± SD. *P < 0.05 compared with control cell levels. □, Control; ■, PGE2; □, celecoxib. To determine whether inhibition of COX-2 would have potential efficacy in treating RRP, we conducted a pilot study treating three RRP patients (Table 1) with celecoxib. All three had established adult-onset disease, requiring surgery at least three times in the year before surgery. Duration of disease before enrollment ranged from 2 to 23 years. Subject 3 had a long history of tracheal disease; the two others had extensive laryngeal disease. The design of the study is shown in Figure 4A. Six months after enrollment, patients received either celecoxib (arm 1) or placebo (arm 2) for 1 year, followed by 1 year on the alternate study drug. Subjects 1 and 3 were in arm 2 and received placebo for the first year. All three patients were followed for an extended period of time after completion of the structured study. Clinical response to celecoxib therapy. (A) Design of the pilot study, showing the initial 6-month “run-in” period and randomization to one of two arms 1 wk before baseline surgery, with patients receiving 1 year of either celecoxib (arm 1) or placebo (arm 2) followed by 1 year on the alternate treatment. (B) Papilloma growth rates are shown for the three patients in the pilot study, from time of randomization through the structured study period and continuing to the end of the unstructured follow-up period. The rates during the time that the patients were on celecoxib are indicated in red. Patients underwent laryngoscopy/bronchoscopy with complete removal of all visible papillomas at each indicated time point, ±3 wks as required for surgical scheduling. Growth rates are calculated as total tumor extent score divided by number of days since previous complete surgical removal. Rates of ≥0.03 are classified as moderate to severe disease. Direct bronchoscopy photographs show the trachea of subject 3 at the time celecoxib therapy was initiated and after 6 months of treatment. All three patients showed a response with celecoxib treatment, with complete cessation of recurrent growth for at least a period of time while on celecoxib (Figure 4B). Two of the three achieved extended remission times, which may be permanent. The other subject, who needed the longest treatment time to achieve a response, had recurrence of disease after cessation of treatment. The response of subject 3 was particularly striking; this subject had significant tracheal disease. The direct bronchoscopy images in Figure 4B, taken at the initialization of treatment and 6 months later, illustrate the change in appearance of his trachea in response to celecoxib therapy. He has remained free of disease for >4.5 years. Rac1 is a known potential oncogene (7,22), and COX-2 is an inducible enzyme that is expressed in cervical, oral, laryngeal, breast, lung, colon and bladder cancers (23, 24, 25, 26, 27, 28, 29), as well as in respiratory papillomas (3). Here we show that these proteins can be expressed at high levels in the airway without any obvious pathophysiology, since they are elevated in 100% of the clinically normal tissue from the RRP patients studied. The aberrant expression of Rac1 and COX-2 appears to be inherent to the RRP patient, rather than a local response to adjacent active papilloma, since it was expressed in the trachea of patients whose disease was confined to the larynx. Our earlier studies had shown that Racl in papilloma cells and normal laryngeal epithelial cells is activated by the high concentrations of EGF present in tissue culture medium stimulating the EGFR, which results in COX-2 expression (2, 3, 4). In those studies, COX-2 was induced in both cell types, but at much higher levels in papilloma cells. In this study, analyzing biopsy samples, we conclude that the normal, endogenous EGFR signaling is sufficient to activate the highly elevated levels of Racl in airway tissues from papilloma patients, resulting in COX-2 expression. Our patients’ response to celecoxib serves as a proof-of-concept that activation of the Racl/COX-2 pathway is important for the pathobiology of RRP. This result is further supported by a recent case study in which a single patient with severe RRP who was treated with combined celecoxib and the EGFR inhibitor erlotinib achieved remission and was disease-free at the time of the report, 2 years after treatment (30). Thus, we propose that an active Racl/COX-2 pathway provides a positive tissue environment for expression of HPV-induced airway disease. COX-2 expression may also play a role in other HPV-induced diseases, since we have shown that the COX-2 downstream product PGE2 enhances HPVl6 transcription. HPVl6 causes a number of epithelial cancers and precancers, including cervical cancer and cervical dysplasia, and an earlier clinical study showed that celecoxib treatment induced a clinical response in 75% of the women with severe cervical dysplasia (3l). Although HPV transcription was not investigated in that study, our current data suggest that this response may have been due in part to the effects of celecoxib on viral transcription. The sustained effects of celecoxib after completion of treatment may result, in part, from indirect effects on the immune system. RRP patients suffer from an ineffective immune response to HPV proteins. T helper subset 2 cell (Th2)-like and regulatory cytokines are expressed in the papilloma tissues (32) and expression of many of these cytokines is enhanced by PGE2. This result would contribute to a permissive microenvironment for persistent and recurrent papilloma growth. Inhibition of COX-2, with its subsequent reduction in PGE2 and HPV transcription, may allow the host immune system to establish an effective response that no longer favors papilloma recurrence. In efforts to improve therapy for RRP, a large number of experimental treatments were evaluated, most with minimal success (33). We propose that inhibiting the host mechanisms that promote HPV transcription provide promising targets. We have initiated a multicenter, phase II clinical trial of celecoxib using the trial design described here, but with once-daily dosing, since cardiovascular side effects can thus be reduced (34). The goal of that study will be to confirm that celecoxib is an effective treatment for RRP and to explore in depth the possible mechanism(s) of that response. BM Steinberg has received from Pfizer Inc. a grant of celecoxib and matching placebo that were used in the clinical study. We gratefully acknowledge Marc Symons for helpful suggestions and critical reading of the manuscript. This work was supported by grants 5R01DC00203, 5R01DC008579, 1R01DC008579-S1 and 1F32DC011446 from the National Institute on Deafness and Other Communication Disorders. The content is solely the responsibility of the authors and does not necessarily represent the official views of the National Institute on Deafness and Other Communication Disorders or the National Institutes of Health. Celecoxib and matching placebo were provided by grant 2004-0029 (WS287683) from Pfizer Global Pharmaceuticals, New York, New York, USA. Celecoxib was used for the clinical study and was obtained through a grant from Pfizer.